Save a fish, use a Boga Grip! The bottom line is that the Boga Grip is such a great quality useful tool, it gets countless free publicity on the cover of most of the popular fishing magazines. The company does not advertise and its popularity is tremendous among fishing enthusiasts in the know. This tool protects a fish during a release by minimizing the amount of protective slime removed from a fish during handling. This tools also accurately weighs a fish. The BogaGrip is a high-quality fish landing, handling and weighing tool. It handles fish by encompassing the fish's lower jawbone and works on most species of fish. The BogaGrip features easy, one-hand operation and will accurately weigh fish. The BogaGrip is very saltwater resistant. It is ideal for the wade and bank fisherman, as it clips nicely to a fisherman's apparel; but it is equally at home in a boat. 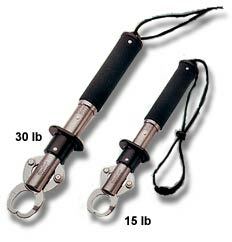 The BogaGrip is built to handle fish weighing double its scale capacity. The BogaGrip is designed to promote "catch and release fishing," as it will land, handle, and weigh fish quickly and simultaneously without injury to the fish. The BogaGrip also affords an easy opportunity to inspect and take pictures of the fish. Since it doesn't wipe off the protective slime nor puncture the fish, and allows the fish to be quickly returned to the water, fish that are handled and released using the BogaGrip should be more likely to survive. 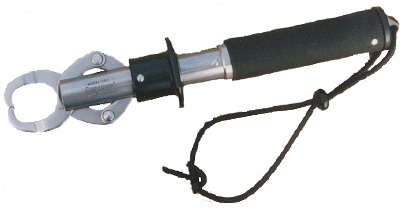 The BogaGrip is particularly good for handling fish in cold weather, or hard-to-handle fish such as toothy fish, slimy fish, or fish that are likely to fin or cut a fisherman. It also keeps a fisherman's hand at a safer distance from hooks. The BogaGrip is generally tube shaped, with one end serving as the grip and scales, and the other end with a pair of jaws. 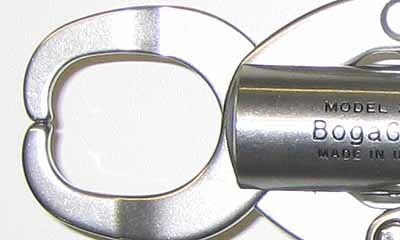 It has a trigger sleeve that slides along the main tube, serving as an opening and closing means as well as a lock. The grip consists of a sleeve tube covered with a non-slip grip. The grip sleeve slides over the main tube and is linked to it through the scale spring. The main tube has a precision scale embossed in it to match each individual scale spring, and the scale is calibrated using certified weights to insure accuracy within one increment. You can send your BogaGrip to IGFA (954-927-2628 Dania Beach, FL) where they can certify it for world-record catches. The BogaGrip is made in the USA of USA-made materials. All metal parts of the BogaGrip are made of 300 series stainless steel, with the exception of the precision scale spring, which is 17-7 PH stainless steel. All plastic parts are made from acetal, which is a high-performance engineering thermoplastic that is used in unlubricated bearing applications. Acetal is tough and resilient and is very resistant to UV light. Constructing the BogaGrip of these materials makes it very strong and resistant to conditions encountered while fishing in fresh or saltwater.